Semi Ajayi celebrates the opening goal. 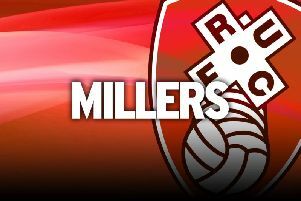 For the majority of a high-intensity afternoon at the AESSEAL New York Stadium, Rotherham matched league leaders Leeds. Having led through a sensational Semi Ajayi goal in the first half, they looked liked taking a well-earned point after being pegged back by Mateusz Klich’s strike after the restart. But the Millers are just beginning to fall short in the Championship this season and they did again as Klich netted a winner in the last five minutes. If Rotherham’s survival hopes were pinned on effort and desire, they would be on the beach already. But unfortunately it’s points that matter and a sixth defeat from seven league games has them embroiled in a bitter fight. This was a classic Rotherham type performance, in the face of their higher-placed opponents, scrapping for everything. The manner of Ajayi’s opener just before the half-hour mark was perhaps not so common. It was from the ridiculous to the sublime for the Nigeria international, after his mind-boggling miss from inside the six-yard box against Brentford last week. After a fizzing, one-touch move, Ajayi, playing in midfield, advanced on goal and unleashed an unstoppable effort into the top corner. New Leeds goalkeeper Kiko Casilla, signed last week from Real Madrid, was facing shots from Gareth Bale and Karim Benzema in training recently and he would have not come up against anything better than Ajayi’s effort. If that goal was going to count for anything, Rotherham were going to have to defend to their best, but Clark Robertson’s failure to put the ball in to Row Z, instead shepherding for Marek Rodak to collect, proved fatal and Klich nipped in to poke home, though there may have been a handball in the build-up. After Casilla had produced a wonder save to deny Will Vaulks, another Millers mistake lost them the game. Jerry Yates was dispossessed in his own half, Leeds broke and Klich won the game in the 86th minute. “It is always difficult to concede that late on because it doesn’t allow you to throw the kitchen sink at them,” Warne said. “I am 100 per cent honest and I am proud of their performance. We limited them to very few chances. For Leeds, who were far from their best, this is the sort of result that normally happens to teams who go on and win promotion. Worryingly, for Warne’s men, it is also happens to teams who get relegated.